New Orleans Group Faces Calls To End Its Use Of Blackface At Mardi Gras Every year, African-American members of the Zulu Social Aid and Pleasure Club paint their faces black for the city's Mardi Gras celebrations. Now, they're facing calls to end the practice. King Zulu waves to the crowds from his float on Mardi Gras day on Feb. 24, 2009 in New Orleans. The Zulu Social Aid & Pleasure Club is facing criticism for its tradition of wearing black face makeup during Mardi Gras. This Tuesday's Mardi Gras celebration in New Orleans has thrust into the spotlight a controversial local tradition dating back more than 100 years. Every year, members of the city's Zulu Social Aid and Pleasure Club don grass skirts, feather headdresses and bone jewelry for the Mardi Gras parade. The Zulus' African-American members — and even some of their white members — also paint their faces black. The practice has been an oddity existing in plain sight since the Zulu club adopted it in 1909 to pay homage to Zulu warriors in South Africa. But in the weeks since photos depicting a person in blackface were discovered on the medical school yearbook page of Virginia Governor Ralph Northam, the national conversation about blackface has intensified. Now, the Zulu club tradition is under new scrutiny. Zulu is one of the many African-American Social Aid and Pleasure Clubs in New Orleans. The clubs sponsor community service projects, serve as social gathering spots and organize lively parades that wind through the streets of the city's neighborhoods on Sundays. On Fat Tuesday, massive crowds gather along the parade route to watch the floats and try to catch a painted coconut, the Zulu prize throw. "The Zulu club was founded in response to the racism that was present in Mardi Gras where black people were not allowed to participate" in the parade-day celebrations of historically-white social clubs, said Shantrelle P. Lewis, an historian who studies blackface traditions, in an interview with NPR's Michele Martin. For the Zulus, she said, "it was a way to combat some of the racism and segregation taking place in Mardi Gras." But now, some in New Orleans are accusing the Zulu club of racism. Take 'Em Down NOLA, a group that has worked to remove Confederate statues from the city, protested across the street from the Zulu clubhouse last month. "They know good and damn well that this blackface has its roots in minstrelsy and they are the modern-day minstrels," Take Em Down NOLA's Malcolm Suber told the New Orleans Advocate. "They are strictly for the white guests who come to town to take part in Mardi Gras." The Zulu club has faced similar criticism before. In 1949, musician Louis Armstrong was pilloried when he appeared on a float at the head of the Zulu parade with his face painted black. And according to a narrative of Zulu history posted on the group's website, membership dwindled to only 16 people during the black power movement of the 1960's, when the Zulus' grass skirts and blackface were considered out of step with the times. In 1965, the Zulus bowed to pressure from the African-American community to parade without the typical face makeup, according to Jarvis DeBerry, a columnist with the Times Picayune. They paraded with masks instead, until defiantly returning to the traditional face paint two years later. In the run up to this year's Mardi Gras celebration, the club has remained unwilling to change its parade costume. At last month's protest at the clubhouse by Take 'Em Down NOLA, several Zulu members put on black face makeup to taunt the demonstrators. In a statement, the club called the blackface minstrelsy of the past "a racist and vile form of entertainment," and distanced Zulu parade makeup from the blackface worn by people intending to mock African-Americans. 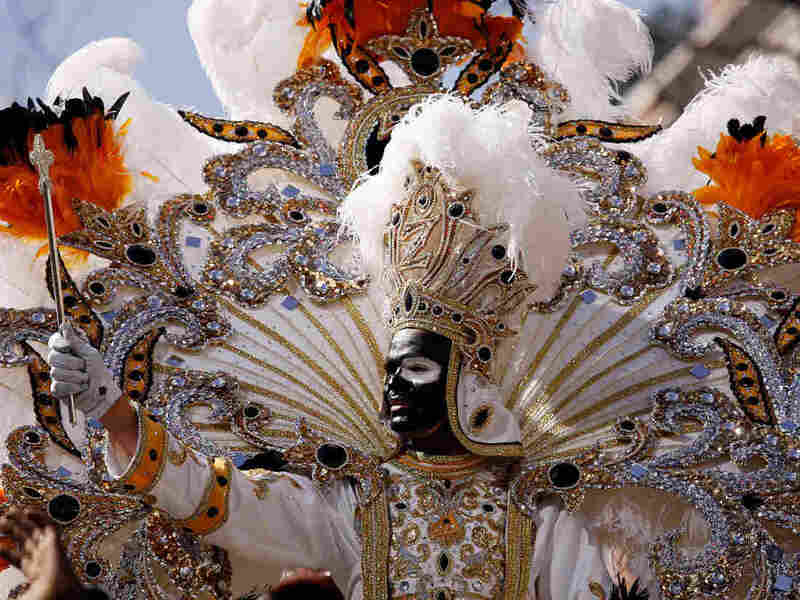 "Unfortunately, the offensive conduct of these individuals might cause some to confuse those racist actions with our rich history and traditions – which include wearing black makeup during the Zulu parade," the statement said. "If you're looking at the Zulu club within a tradition of masquerading and masking... then painting one's face is a part of Carnival," said Lewis. And as a proud New Orleans native, she said she finds the Zulu costume to be appropriate, given the context. "While it's connected to minstrelsy, historically it was more rooted in this idea of a masquerade." Furthermore, Lewis said, it's a New Orleans tradition that many outsiders simply wouldn't understand. "New Orleans understands New Orleans' traditions, and the city has been very insular," Lewis said, echoing local writers who blame "clueless outsiders" for misunderstanding local culture. "A lot of our traditions have existed without the participation and the scrutiny of people outside of New Orleans. And for the average black person in New Orleans, including members of my own family, they simply do not connect the blackface in Zulu with minstrelsy ...and they most certainly are not looking at it as an offense." "I see why it's nuanced," she said. "But you can't take it out of the context from which it was originally created." This story was edited for radio by Martha Wexler.